When Melody Lowery visits her aunt’s house at Bay Harbor, Michigan, she collects golf balls that wash up along the Lake Michigan beach. There are more than a handful along the shore of Little Traverse Bay. “One time, we filled up more than a suitcase collecting golf balls,” said the Midland, Michigan, resident. 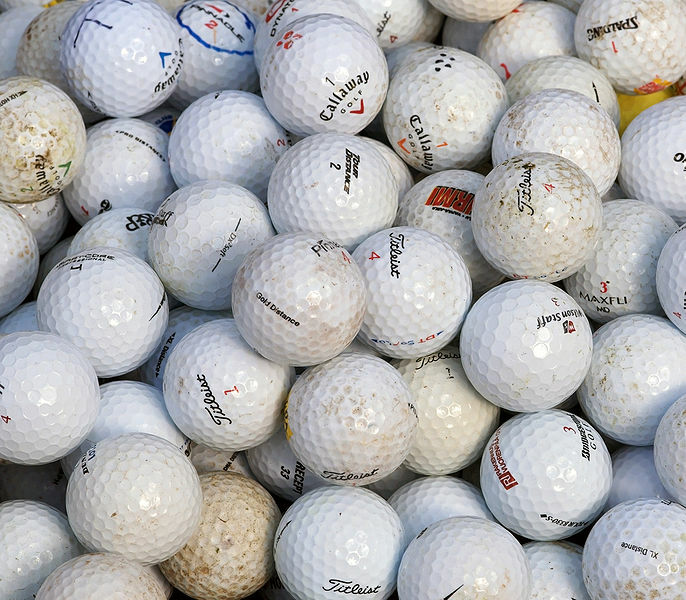 While microplastics get plenty of attention as a Great Lakes pollutant, researchers say there is not enough information to know if these macroplastic golf balls pose similar harm in freshwater systems. NPR recently reported that divers in Carmel, California, found more than 50,000 golf balls over two years. These golf balls release zinc compounds that are toxic and also degrade into microplastic pieces. Sediment studies that occur far off the coast are unlikely to measure golf ball pollution in the Great Lakes, said Sherri Mason, a Great Lakes microplastics expert and the sustainability coordinator at a Penn State Behrend University in Erie, Pennsylvania. That makes it hard to get significant data. Michigan leads the nation in the number of top courses with national acclaim. But there is no fine for hitting golf balls into lakes, said Adam Ikamas, the executive director of the Michigan Golf Course Superintendents Association. That may be due to uncertainty and lack of opportunity. The effects of this plastic pollutant are unknown. And there are maybe two dozen courses where golfers could hit balls into the Great Lakes, Ikamas said. Some scientists say that the decomposition of millions of golf balls may pose a problem. Dangerous levels of zinc were found in the synthetic rubber filling used in solid core golf balls, researchers for the Danish Golf Association told CNN. The zinc can poison vegetation. And golf ball chemicals can break down into microplastics which animals eat, according to a study in the Marine Pollution Bulletin. We don’t yet know if decomposition in freshwater systems is the same as in the ocean, Mason said. The Great Lakes have a lot more life that could be aiding in the breakdown of golf balls. While an estimated 300 million golf balls lost at the bottom of U.S. water hazards may make some people uneasy, a Michigan man is set on retrieving them. Jim Starr, president of Absolute Golf Ball Retrieval in Utica, Michigan, has a network of independent divers who retrieve the balls from water hazards. After retiring as a Middle East contractor, Starr built the golf ball recycling business that works with more than 400 Michigan golf courses and employs disabled workers. The corporation is unique because it employs a segment of the population that normally has a disadvantage finding work, Starr said. He employs close to 100 people through Growth and Opportunity, a non-profit corporation in Lapeer County. They refurbish, package and recycle millions of golf balls collected by Starr and other divers. “I retrieve millions of golf balls and I barely touch the whole entire state,” said Starr, whose business expanded in 2017 after he joined a cooperative called Golf Ball Divers Alliance. This partnership helps maintain a fair payment to independent divers, he said. By allowing for the direct sale of golf balls to customers, the cooperative also maintains an affordable price. There isn’t a noticeable change in the playability of balls that have been submerged for up to three months, according to a study done by Michigan’s Oakland University. Not as many balls are retrieved from rivers and streams as from standing lakes and ponds.